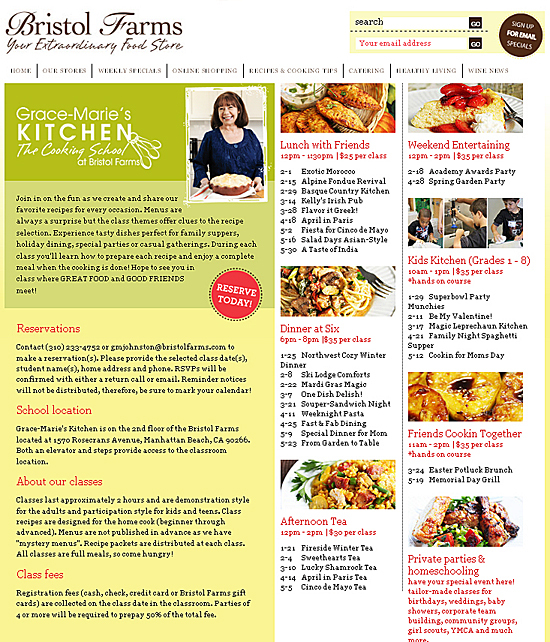 Something very exciting happened recently – the Grace-Marie’s Cooking School at Bristol Farms web page is now featuring my photographs. Grace-Marie and I are so thrilled!! Below is a picture of the web page from their art department. You may recognize some of the photos. Sorry it’s not very clear…you can see it better on their website here. As you may have guessed, since I have 25 posts about Grace-Marie’s Kitchen, that I love her, I love her recipes and I love photographing her classes. In March and May there will be a new hands-on class called “Friends Cookin Together” and I can hardly wait to photograph the students actually doing the cooking themselves. You should sign up now. Really. Here you can see Grace-Marie in the top two photos and the demonstration cooking area with the overhead mirror. On the bottom are two of Grace-Marie’s assistants and a birthday girl, who got to wear the Birthday Hat and was sung Happy Birthday by the whole class. It was very fun! 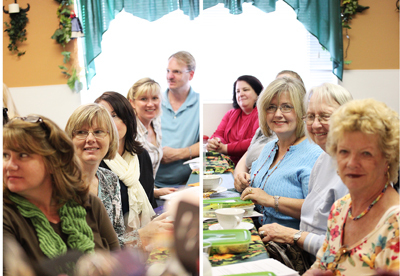 This is a photo of some of the students in the sunlit classroom that is homey, with warm colors and artwork, sitting at the communal tables with tablecloths and seasonal decorations down the center. They’re with convivial companions and fellow foodies, anticipation building as they watch Grace-Marie cook, and smell the delicious aromas wafting from the stove and oven. The wonderful thing about Grace-Marie’s classes is that she makes you feel like your best friend invited you over for lunch and went all out with the food, the decorations, the white china, the whole works. The whole classroom is filled with homey touches. 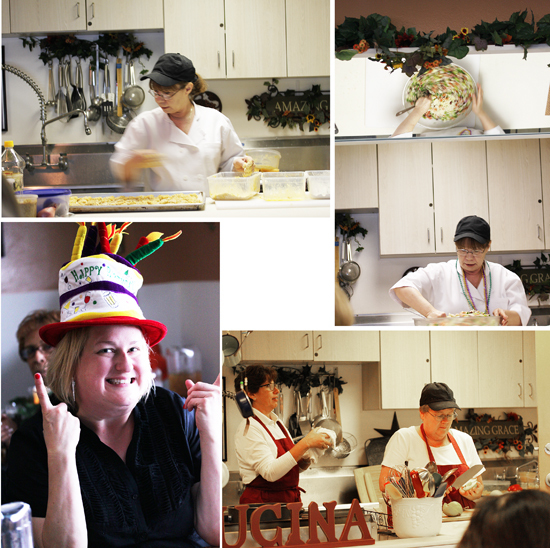 Here you can see the first class I photographed from the Kid’s Kitchen cooking class. They were so engrossed and well-behaved, and had so much fun. You can see the entire post about the kid’s cooking class “Leprechauns in the Kitchen” for St. Patrick’s Day here. 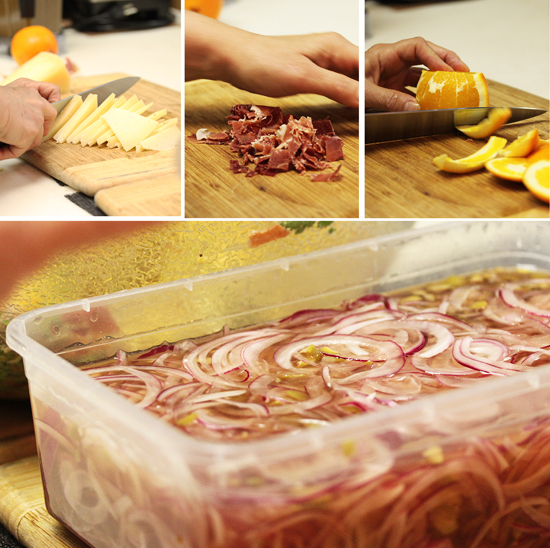 The Valencia Salad with Oranges, Serrano Ham and Manchego Cheese was from the Weekend Entertaining class which also featured Sizzlin’ Spanish Paella and Sangria Glazed Caramelized Pears. 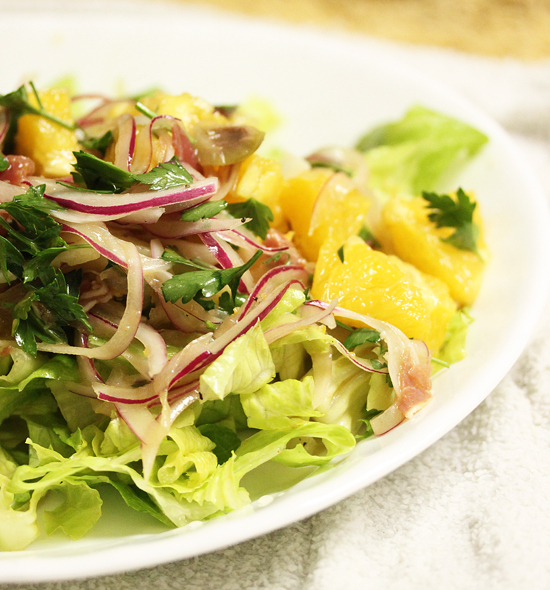 The Orange Marmalade Vinaigrette for this salad is to die for. You can see the onions bathing in the sherry vinegar, granulated sugar, water and green olives with their juice before being drained to put in the salad. 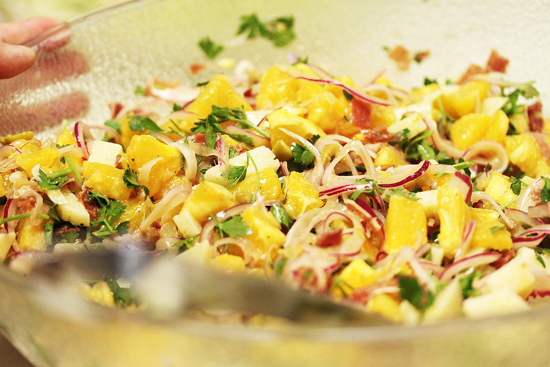 This is such a beautiful salad, with the red, orange, yellow and green ingredients. The sweet vinaigrette and oranges with the salty cheese and ham are a delight to the taste buds. Don’t you just want to stick your fork in there and take a big bite? 1. Combine onions, olives (with or without pimento) with juice, vinegar and sugar. Add just enough water to cover. Set at room temperature for 1 hour or refrigerate until ready to use. Drain before using, discarding liquid. 1. Combine marmalade, vinegar, shallots and paprika in a blender. Process until smooth. 2. Add the oil and blend until emulsified. Season with salt and pepper. 1. Toss the lettuce with a drizzle of vinaigrette. Mound lettuce into individual plates. 2. 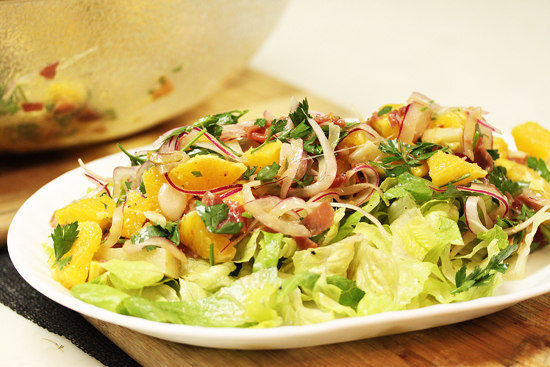 Toss oranges, ham cheese, onion mixture (drained) and parsley with remaining vinaigrette. Arrange alongside or on top of the lettuce. Serve. of course they are… your pictures are AMAZING! Not only do I want to eat this entire salad, I want to live closer so I can come to one of these dinners, amazing. Congrats! I always thought your photos were print-worthy. I have been on such a salad kick lately–which is strange, since I usually am on a SOUP kick during the cold months! Must be the mild winter This looks delish! Congratulations, that’s fantastic! And this salad is just gorgeous!